Trestle Glen Vineyards estate wines represent the unique vineyards from which they come. Available only through our allocation membship, each limited-production wine is of exceptional quality. Our Hillside block has sparse, gravely, volcanic soil that ensures low vigor, low yield, and small, concentrated berries. This classic dark ruby red Cabernet Sauvignon boasts aromas of violet, cassis, plum, and black cherry wrapped in an oak bouquet of toasty vanilla, mocha, caramel, and nutmeg. Rich and well-rounded luscious flavors of black cherry and berry combine with supple tannin on a lingering finish. Pair with braised lamb shanks, beef short ribs or sirloin, and cheeseboard selection of aged cheddar or gouda. Trestle Glen Vineyards is named after the narrow gauge railroad constructed through Sonoma Valley in 1882 that connected the town of Sonoma to Glen Ellen. Remains of the original train trestle that crossed Sonoma Creek can still be found on the vineyard property. This wine captures the rich history of America’s early railroad expansion. Product will be available Fall 2019. Sign up to become a Member to secure your allocation. Bordering Sonoma Creek, this sustainably farmed vineyard block features gravely volcanic soil, granting concentrated berries and complex character. Deep ruby red in color. Enticing fruit aromas of plum, black cherry, and cassis mix with an herbal potpourri of sage, spicy oak, vanilla, and subtle cedar cigar box. The vivid palate includes bright cherry, sweet berry, and oak flavors wrapped in silky tannin. Pair with blue cheese burgers, beef stew, pork tenderloin, and garlic chicken wings. 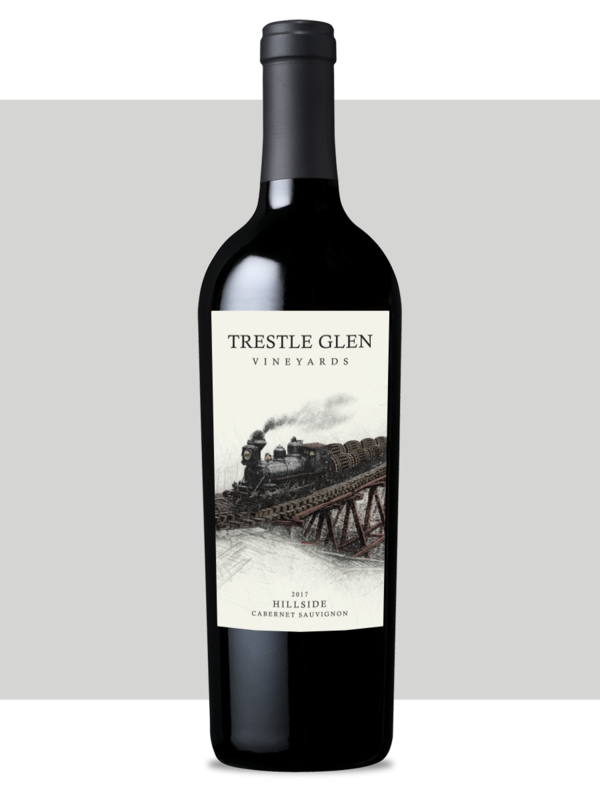 Trestle Glen Vineyards is named after the narrow gauge railroad constructed through Sonoma Valley in 1882 that connected the town of Sonoma to Glen Ellen. Remains of the original train trestle that crossed Sonoma Creek can still be found on the vineyard property. This wine captures the rich history of America’s early railroad expansion. Product will be available Fall 2019. Sign up for our Enthusiast Membership to guarantee your allocation.